Welcome to Gone in 60 Minutes, one of the most exciting escape room experiences serving Fort Collins with mystery and puzzle games! Whether you are looking for a fun and challenging team building activity for your staff or a new way to spend date night, we have an adventure for you. Our escape room missions are an excellent way to test your problem solving and critical thinking abilities, while working in a team environment. By working together, you and your friends can solve the brain-teasing clues at our Fort Collins escape room to reach the rewarding conclusion! 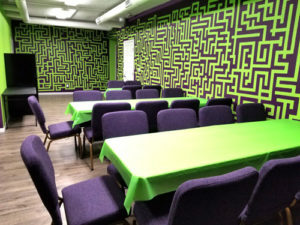 While there are several Fort Collins escape room options, our mystery and puzzle games offer your group the most unique and challenging experience. Our games are designed to engulf you in the story, making you the hero to an exciting adventure. Each challenge is creatively designed and features engaging elements like art, music, and competitive scenarios. Our escape rooms are family-friendly and the perfect activity for people of all ages and any skill level. Whether you want to have a unique birthday party or a fun night out with friends, Gone in 60 Minutes is the perfect choice for you! Gone in 60 Minutes is Northern Colorado’s most unique escape room experience with mystery and puzzle games, serving thrill-seekers throughout the Fort Collins area. Our attention to detail and creative missions will show you why we are the leading Fort Collins escape room experience! Reach out to us today to schedule an adventure that you will never forget!